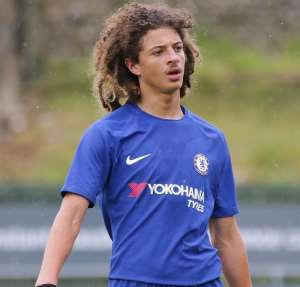 Ghanaian youngster Ethan Ampadu registered his name on the scoresheet for Chelsea U19 in their 5-2 demolishing of Feyenoord U19 in the quarter-final stage of the UEFA Youth League. The Welsh-born enforcer put the Blues ahead on the 10th-minute mark with a thumping header at the Aldershot Recreation Park. Further goals from Daishawn Redan, Harvey S. Clair and own goals from Lutsharel Geertruida and Boyd Reith propelled Chelsea to victory. Whiles Achraf El Bouchataoui and Noah Lewis grabbed the consolation goals for Feyenoord. Ampadu was taken off at half time while Callum Hudson-Odoi enjoyed the entire duration of the match. The Londoners will now face Real Madrid in the next round of the competition. He is eligible to feature for either Ireland, England, Ghana or Wales at the senior level despite playing for the Welsh youth side.